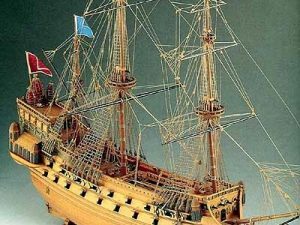 HMS AGAMEMNON – The Agamemnon was one of seven ships built to the same design, drawn by the same naval architect that designed the famous Victory, Sir Thomas Slade. 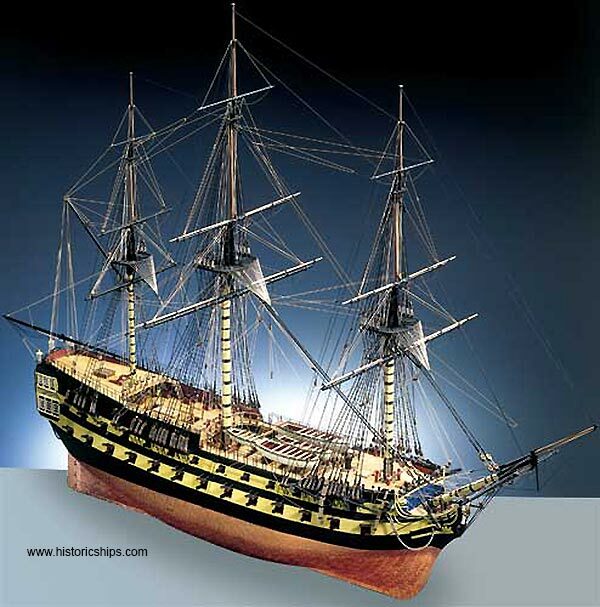 Agamemnon was the third to be built in the class, the first two being Ardent in 1762 and Raisonnable, laid down in 1763. 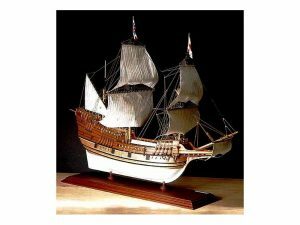 Third was Agamemnon, followed by Belliqueux in 1778, Stately in 1779, Indefatigable in 1781 and finally the Nassau in 1783. A Third Rate ship of the line like Agamemnon was an expensive warship to build. The construction of the ship’s hull with yards and masts fitted cost the Admiralty £20,579 (in today’s terms, approximately £12 million), a figure that did not include ordnance, sails, hemp, copper plating and other hardware. For three of the most crucial decades in British naval history, Agamemnon always seemed to be at the centre of the action, having no less than eleven battle honors. Agamemnon’s maiden voyage was on 9th July 1781 under the command of Captain Caldwell. Her first engagement was at the battle of Ushant on 12th December 1781 where the British fleet under Rear Admiral Kempenfelt defeated the French fleet and captured a significant number of ships, including the convoy the French were escorting. Agamemnon’s next major engagement was at the Battle of The Saints on 12th April 1782 where Rodney and Lord Hood’s fleet defeated Comte de Grasse’s French fleet. On 7th January 1793, Nelson learned from Lord Hood that he had been chosen to command his first ship of the line, the Agamemnon. Although initially disappointed that he had not been given command of a 74, Nelson soon grew fond of Agamemnon. Nelson wrote to his wife, Fanny. She was, he said, “Without exception one of the finest ships in the fleet, with the character of sailing most remarkably well”. He also wrote after twelve days in a storm in the Mediterranean in “Gales and lumping seas but in Agamemnon we mind them not; she is the finest ship I ever sailed in, and were she a 74, nothing should induce me to leave her while the war lasts”. Even a French Commander Admiral Alemand expressed the view that Agamemnon was one of the fastest ships in the British Navy. That, coupled with Nelson’s inspirational command made her a very potent fighting unit. 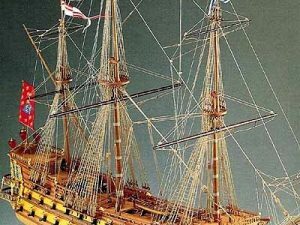 Nelson commanded Agamemnon, or “eggs and bacon” as her crew affectionately called her, until 10th June 1796. In that time Nelson had proved to be a great Commander, tactically and physically. It was during his command of Agamemnon that Nelson lost the sight of his right eye. When at the Siege of Calvi in 1794 during the morning of 10th July, Nelson was hit in the face and chest by splinters, stones and sand that were thrown up by an enemy shell that hit a battlement during a shore action. On 13th June 1796, Nelson’s broad pennant was transferred to the 74 gun Captain at anchor in San-Fiorenza bay. He watched the worn out Agamemnon sail to England for a much-needed refit. She was refitted from the bottom up at Chatham. When re-commissioned in 1797 she was ordered to join Admiral Duncan’s squadron off Yarmouth, which was keeping watch on the coast of Holland. She was immediately caught up in the naval mutinies of that year. Agamemnon was however considered untrustworthy by Richard Parker the leader of the Nore mutineers and had the guns of the mutinous ships trained on her to ensure she did not ‘blackleg’. Subsequently in the proceedings that followed all thirteen of Agamemnon’s crew who were tried were pardoned. Agamemnon’s next major fleet engagement was the battle of Copenhagen on the 21st April 1801. Unfortunately she was grounded on a shoal for most of the action, but Nelson won the battle and a truce with Denmark was negotiated. On the 21st October 1805 Agamemnon took part in the battle of Trafalgar. When Nelsons favorite ship hove in sight a week before, with Nelsons old friend Sir Edward Berry in command of the Agamemnon, Nelson was delighted “Here comes that damned fool Berry! Now we shall have a battle.” At Trafalgar the 27 British ships of the line defeated the Franco Spanish fleet of 33 line of battle ships in a victory that ensured British supremacy of the sea for the next 100 years. Later in Agamemnon’s career, she served in the West Indies, taking part in the battle of Santo Domingo, and then in South American waters. Agamemnon was wrecked in Maldonado Bay off the coast of Uruguay on the 16th June 1809. Divers have recently discovered the remains of HMS Agamemnon on the bottom of Maldonado Bay, after a six-year search by marine archaeologists. Strewn around the site are hundreds of copper plate, as well as a 24 pounder cannon, parts of the pumping devices as well as a significant amount of shot, bolts and copper nails. Also discovered was a silver pocket seal, complete with fob chain. On its face of translucent stone it bore a star shaped emblem with the name ‘Nelson’ in mirror image incised in a curve above. Twenty-six, twenty-four pounder – Gun deck. Twenty-six, eighteen pounder – Upper deck. Twelve, nine pounder – Quarterdeck. Complement – 491 officers and ratings. 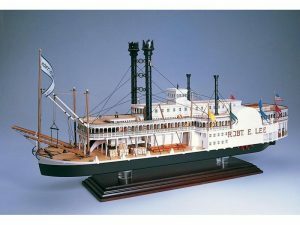 The Caldercraft Agamemnon kit features: Double plank on bulkhead construction, Keel and bulkheads are CNC cut in Birch ply as are all the major constructional parts. Extensive use of CNC cut Walnut has been employed for the majority of visible structures and fittings. The wood strip pack contains Lime wood for the first planking, Walnut for the second planking and Tanganyka for the decks. Ramin dowel is supplied for the masts and yards. Walnut and etched brass stern gallery windows, with the remaining tafrail decoration in finely cast white metal. Scale brass cannon barrels with walnut carriages. 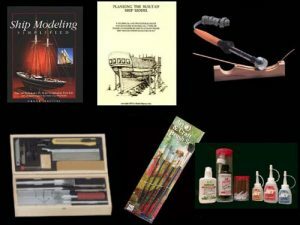 Rigging thread is supplied in natural and black to rig the model as depicted in the photographs. Beechwood deck gratings and Walnut Blocks and deadeyes. Shroud cleats, trucks, stunsail yard brackets as well as CNC cut Walnut tops, crosstrees, trestle trees, mast caps and a wealth of unique detail parts. Copper plates are provided to sheath the hull bottom. Fully detailed full size plans and a comprehensive construction manual.